From the Sunday Times top ten bestselling author of The Psychopath Test, this is a captivating and brilliant exploration of one of our world's most underappreciated forces: shame. 'The terror of what?' I said. For the past three years, Jon Ronson has travelled the world meeting recipients of high-profile public shamings. The shamed are people like us - people who, say, made a joke on social media that came out badly, or made a mistake at work. Once their transgression is revealed, collective outrage circles with the force of a hurricane and the next thing they know they're being torn apart by an angry mob, jeered at, demonized, sometimes even fired from their job. A great renaissance of public shaming is sweeping our land. Justice has been democratized. The silent majority are getting a voice. But what are we doing with our voice? We are mercilessly finding people's faults. We are defining the boundaries of normality by ruining the lives of those outside it. We are using shame as a form of social control. Simultaneously powerful and hilarious in the way only Jon Ronson can be, So You've Been Publicly Shamed is a deeply honest book about modern life, full of eye-opening truths about the escalating war on human flaws - and the very scary part we all play in it. 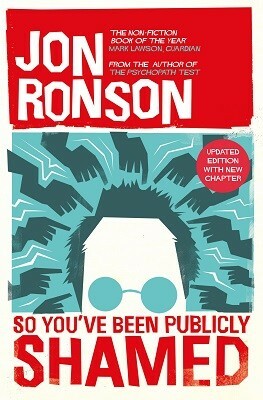 Yet another piece of provocative, addictive journalism from the immensely likeable Jon Ronson. A big thank you to Picador (in the UK) for sending me a preview copy. Everyone who shoots their mouth off online, safe behind the anonymity of their computers should be made to read this book.